How Many Wedding Photographers Do You Need? When I started out as a wedding photographer back in the dark ages, my first gigs were as a second photographer. The second photographer’s duties include hanging with one half of the couple during getting ready, covering different vantage points during the ceremony, and supplementing the primary photographer’s work throughout the day. Since this was the only wedding photography experience I had, I thought it was the standard to have two photographers photograph a wedding together. In fact, most of the weddings booked here at Pizzuti Studios include two photographers. However, we also offer options that include only one photographer, and I think you’ll find that most other wedding photographers do the same. So, how do you know for sure how many photographers you’ll need at your wedding? There are a few questions you can ask yourself to help determine if you need one or two photographers to capture your wedding day. First, how many guests are you expecting? Smaller weddings might not require as much coverage as larger weddings. 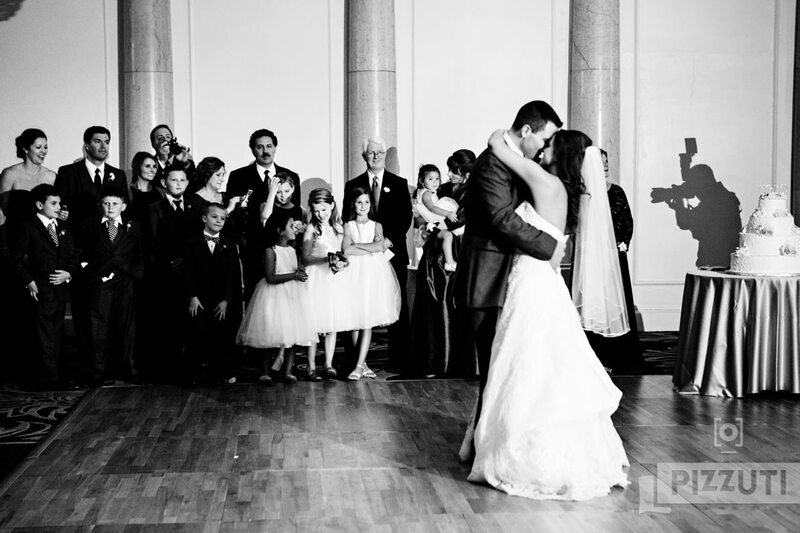 In our experience, weddings with under 75 guests most likely don’t require a 2nd photographer. Weddings over 125 guests usually benefit from another pair of eyes. That second photographer can focus on the guests, while the primary can focus on the happy couple, and vice versa. How important are “getting ready” photos? These photos will ultimately allow you to see all the activity and anticipation leading up to the ceremony. The transition from “regular person” to Bride or Groom. Will you be getting ready at a separate location from your fiance? Hiring two photographers maximizes the coverage of your wedding prep. If there are multiple locations, one photographer can’t be in more than one place at a time, so getting coverage of both people might not be possible in that instance. Two photographers can split up between the couple and double the coverage. Are you interested in photos of your cocktail hour? Some couples want to see every second of the day; they love seeing their guests mingling and enjoying themselves. What about those table top details you spent weeks agonizing over? Or the name cards you so painstakingly designed yourself? If the photographer is with you during cocktail hour, photographing the family and wedding party portraits, they can’t be inside photographing your wedding details. By the time they make it back into the reception space, many of the guests have put their jackets and purses at their tables (along with some empty glasses and dirty napkins) and have picked up their name cards. That means the photographer won’t be able to get a “clean shot” of all your details. If you have a second photographer at your wedding, they are able to go inside and photograph the reception space while the primary photographer is busy with you! Figuring out if you need two photographers gets a bit easier if you can definitively answer those questions. Honestly, one great photographer can effectively cover a wedding no matter how big or small, all while making beautiful images. And one amazing photographer is a better investment than two pretty good photographers. Either way, when you speak with potential wedding photographers, it’s important for you to talk about the logistics of your day and what you want to see in your wedding photography. They can address any concerns you might have and guide you through your options. In the end, you’ll have all the information you need to make the right decision.